MOJO has redesigned the MOJO Crow, still using the dual shaft, direct drive motor system, but now with more effective / user friendly features such as…a built in 1 ½ seconds on and 1 ½ seconds off cycler and magnetic wings. The built in Cycle with the on / off feature mimics a Crow fighting or poaching on other injured prey, which causes other Crow to join in. The magnetic wings just slide onto motor shaft quickly and eliminates timely set ups. We have also converted the New MOJO Crow to operate on 6 AA batteries (not included), which keeps the weight down and will run much longer. 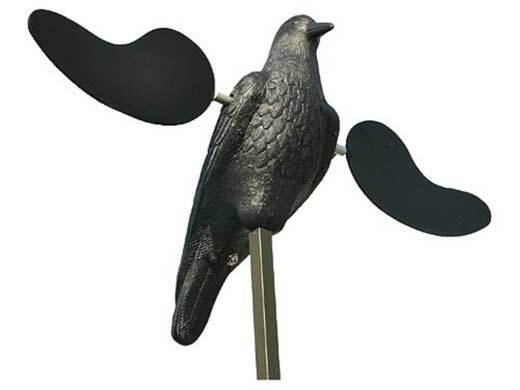 The MOJO Crow will attract Crows from a much farther distance than a standard decoy. Use the MOJO Crow in conjunction with the MOJO Double Trouble for a DEADLY combination.